Sehohle talks to RW about his greatest inspirations, his packed training schedule and balancing fatherhood with the demands of competing on a global running circuit. 1. What are your career highlights so far? I would say I’ve been in the game for almost half of my age, and have been all over the world, won so many races. 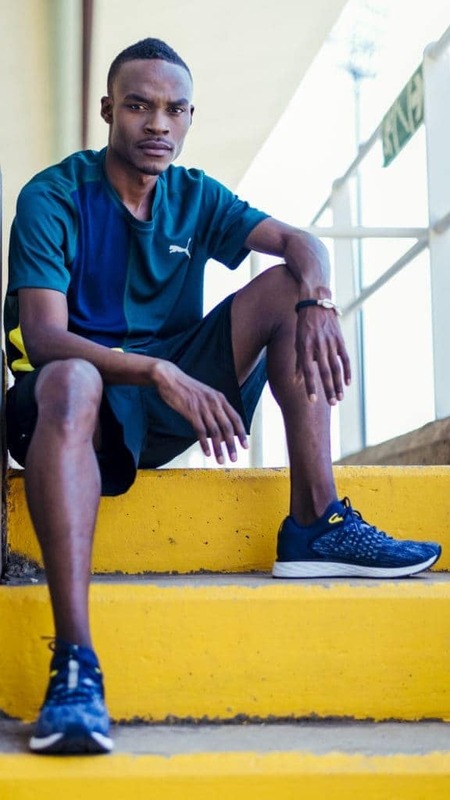 But if I had to choose the highlight, I would say winning the 1500m at the national championships in 2016, after three years of knocking on the door – I finished third in 2013 and 2014 due to a lack of experience. 2. What did it mean to you to become a national champion? Winning the title meant a lot, because it showed that my preparation and the support I had at the time was in place. Before the nationals, the great Mr Henrick Ramala said with the work I’m putting in no one will touch me at the SAs. He supported me with anything that I needed, and all the hard work and the sacrifice paid off! Thanks to the Zoo Lake group! 3. Do you do the road work as part of your stamina training, and how many kms per week? On my program I’ve got two sessions a day; in the morning I run 15km at 3.45 pace and it helps with endurance. 4. Your best official 10km, half marathon, marathon times? I haven’t run a marathon yet, but maybe later this year at the Cape Town Marathon! My personal best over 10km is 29.36 at the Cape Town Marathon, and my PB for 21km is 1:03.58 at the national championships in Port Elizabeth. 5. Any plans to become a marathon runner in the future? Yes, my coach, management and I have already made plans to move to the roads full time. We will be selective in terms of racing here at home as I want to be exposed internationally – I picture myself running the major marathons. 6. How do you manage your role as a father of two with your running career which can take you around the country and around the world? It’s tricky as it’s not easy to balance family and running, but one needs to do what should be done taking no short cuts. Running is my job, so if my family doesn’t understand that daddy has to leave for months then there will be a problem, because bills won’t be paid. I’m glad I’m married to a very understanding and supportive woman. 7. What made you want to become a runner and when did you realise you had what it takes to make running your career? Back in my primary school days I got to see Jerry Motsau at assembly and he had lots of medals. That inspired me. In my younger days I was a soccer player coached by Nthando Ndzandzeka, the PSL referee and his younger brother who was a runner. During practices he would ask us to run 4km to the railway station, pick up a stone and run back. I would outrun everyone and beat them by 4 to 5 minutes. He encouraged me to join athletics and in 2003 I took part in school events, broke records and stole a fierce runner’s spotlight. The late Zet Sinqe then came to develop athletes in my community and he told me that I can change my life through running. 8. Where do you draw the strength to deal with disappointments? Setbacks are part of life, you have no control over them then. Let it be. If there is a solution then you have to follow it up. I would say by God’s grace I haven’t experienced any serious injuries, I have a good team that I’m working with so that I can minimise the risks of injuries. We know when to go hard and when to take it easy. 9. How do you prepare yourself mentally for a big race? Good training works with your mind and if you know you have put in the work then you become strong mentally. Also, I’m a Mo Farah fan, so I use his tactics and they work for me. 10. Do you ever listen to music while running, if so, what’s on your playlist? Yes, it depends on my mood but I’m a King Monada fan. If I’m bit down I listen to gospel – Juanita du Plessis, is the one who uplifts my spirit. 11. Do you think you could beat most people over a 10km race even if you were running backwards? It depends which field you’re talking about – but I can run backwards and still beat people because some of them will be walking! 12. Tell us about any community service projects you support and why you have chosen to put your energies behind these projects? It’s always in my heart to help people, because I am who I am today thanks to someone who gave me many opportunities – Dr Berry continues to help me to this day. Last year, a friend asked me to launch a foundation to help communities and kids in rural areas. We provide them with opportunities, like scholarships to attend better schools and also help them to get to races. We also help the elders in the community by hosting lunches during the festive season and providing them with blankets. It’s hard to help everyone, because we are doing it out of our pockets but once we have solid donors, we can take it far and help more people. 13. Why is the PUMA Speed 600 Fusefit the right shoe for you to run in? The shoe fits well, like it was designed specifically for my feet; the balance and the cushioning is amazing. 14. You recently shared on Instagram “I’m working so hard to reach my potential goals … 2019 will be the year to remember!” What are your goals for the year? 2019 is a World Championships year and I am hoping to better my PBs over 1500m and 5000m. This year will also be the first time I run the 5000m against the likes of Elroy Gelant and Stephen Mokoka. I would like to learn a lot from them as they are my idols; they are great fellas who I respect.